In late May, the nation’s first clean energy partnership between a city and its utilities released its first two-year work plan. It holds true to the notion that the city and utilities can work across a broad swath of energy initiatives in pursuit of increasing energy efficiency and renewable energy. And with some solid metrics, it promises to be an excellent tool for accelerating toward a clean, local, and equitable energy system in Minneapolis. Could it devise a plan that is innovative and ambitious and measurable and achievable within a short time frame? Could it set real benchmarks for achieving these plan items? Could it inform the national conversation about the structure of the utility business model in the 21st century? 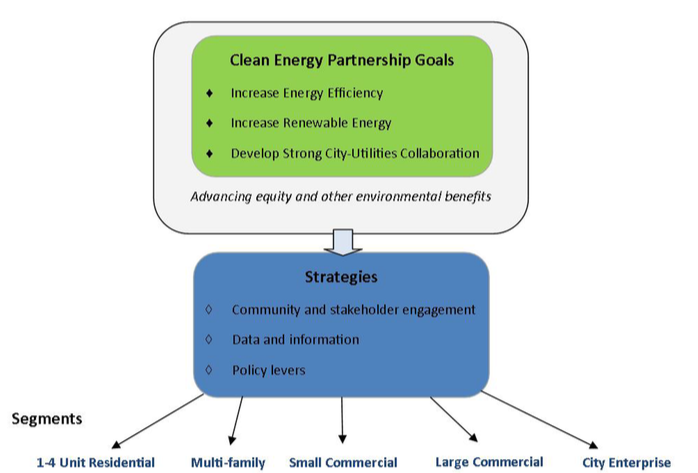 The approved Clean Energy Partnership Work Plan has five ambitious areas of work under the umbrella goals of increasing energy efficiency, renewable energy, and city-utility collaboration (“advancing equity and other environmental benefits” is a sort of sidebar on the list of goals). The Partnership board identified three overarching strategies—engagement, data, and policy—to be applied to four places Minneapolitans live and work: 1-4 unit residential, multi-family residential, small commercial, and large commercial. The final plan area, “city enterprise,” focuses on what the city can itself do. The Partnership should adopt the same quantitative vision as the city, or they risk allowing minimal change to be reflected as success. Note: One additional item fell off the page (kW and annual production from distributed solar projects) and we’ve left off Windsource, which perversely charges a price premium for electric customers to use wind power (despite wind being the cheapest wholesale power resource). 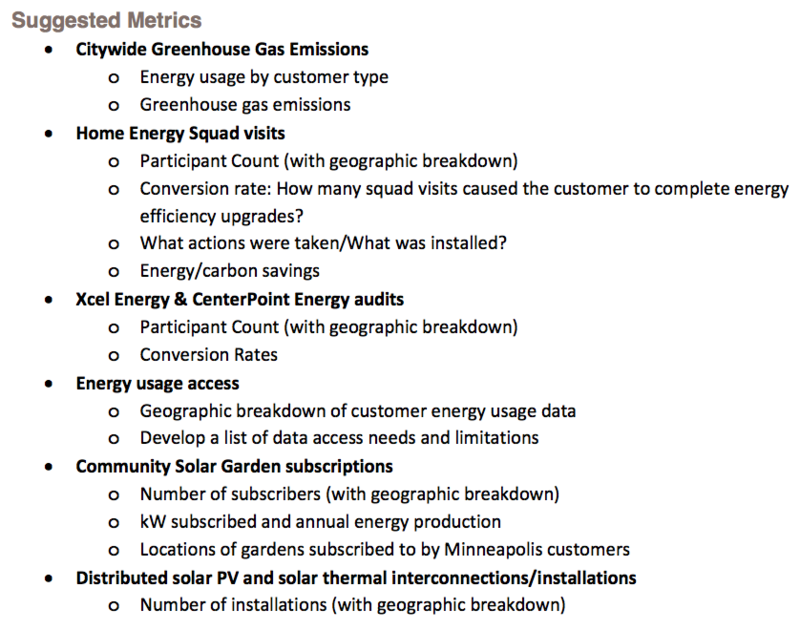 As shown above, the metrics are broken down into various buckets of existing programs, such as the city’s greenhouse gas emissions tracking, and the utilities’ energy efficiency programs. It’s not clear if there will be aggregated data on all Partnership related efforts. Without such data, it will be hard to evaluate if the existing programs run by utilities are being integrated well enough into the Partnership. There are also some big holes in the proposed metrics. The proposed metrics reflect important elements like participant counts by geography, installations, and energy conserved. None of the measures of program success include race or socioeconomic status, despite a lot of language about “equity,” “underrepresented,” or the mayor’s signature One Minneapolis effort. There’s no plan to track employment (especially of disadvantaged populations) or energy dollars kept local, though both are part of the city’s energy vision. There’s no mention of Wards, even though that’s the most meaningful political subdivision of the city. Without meaningful, quantitative targets (and a commitment to measuring progress), there is no way for the city to evaluate if the Partnership is a success or not. We hope the Partnership will add in metrics reflecting the city’s meaningful subdivisions (Wards) and priorities around energy dollars, employment, jobs, and equity. 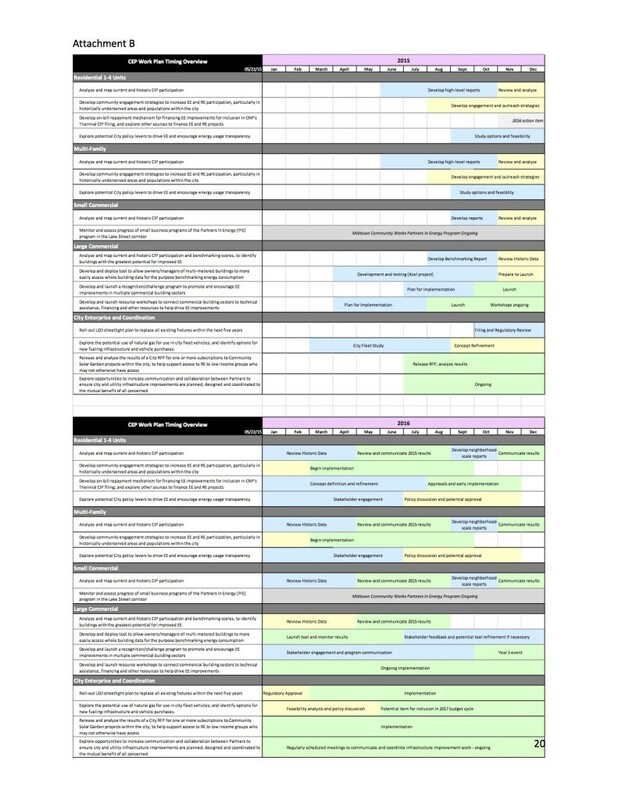 Despite the big questions about metrics, it’s worth diving into some of the specific work plan items. Will community engagement be authentic and substantive? Will it engage organizations like neighborhood groups, low income advocates, and others that have traditionally been on the periphery? Are these potential partners seen as essential or just “nice to have”? Otherwise, it will be hard to move beyond incremental change among a population that skews wealthy and white. And if we aren’t tracking race of participants, how do we know if we’re reaching a population that mirrors the city’s population? Can the city approve an energy transparency law to inform renters and home buyers at point of sale? Minneapolis was one of the first cities to require commercial building energy disclosure and its leadership here could be a tremendous boon to tenants for whom energy expenses of a new home are otherwise a mystery until they receive their first bill. Can the city afford to wait on its utilities for on-bill repayment options? Though no panacea, on-bill repayment is the linchpin to letting residents and businesses—especially those with low credit scores—earn more in energy savings on a monthly basis than they pay for any improvements. Xcel Energy made no commitment to on-bill repayment, and it will be a year before CenterPoint files at the Public Utilities Commission for program approval. Why can’t the city use it’s own utility bill—for water—to offer on-bill repayment in 2016? Will data access on energy use be equitable? The proposal is to ensure building managers and owners have access to data on building energy use, but what about existing and prospective tenants? The small business program has no real program other than observing the utility’s existing “Partners in Energy” program. Where’s the engagement opportunity? The “natural gas city fleet” item is missing the crucial integration with the citywide organics collection and the opportunity to use locally collected and produced biogas for fueling the city fleet. That’s a can’t-miss opportunity to combine lower vehicle emissions with economic development and waste reduction. The Partnership Board will shift into implementation over the next few months, and the timelines are shown in the following graphic. As mentioned above, adopting metrics to measure success will be a key decision in the next few months. Most of the rest of 2015 is given over to “developing” and planning the implementation, hopefully offering an opportunity for the community advisory committee to strengthen the plan, particularly the numbers, to make it a Partnership we can count on.